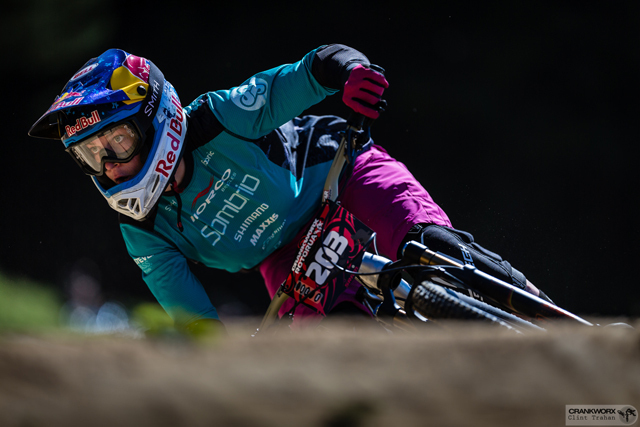 Speed definitely blew style right out of the water in New Zealand, during the Mons Royale Dual Speed and Style at Crankworx Rotorua Thursday, although the first female winner ever awarded in the sport brought her own flare to the track. Thursday evening’s race saw Jill Kintner top Casey Brown in the inaugural Dual Speed & Style women's finals; however, it was fourcross dominator Tomas Slavik’s victorious return to Crankworx, which really stole the show. It has been five years since Slavik competed at Crankworx and his approach, more dual slalom than slopestyle, proved just too efficient for the 2014 CLIF Bar Dual Speed and Style champion, Kyle Strait, who took out heavily favoured Swede Martin Soederstrom en route to second. Speed and Style is a signature Crankworx creation, which challenges head-to-head competitors to balance the need for speed against extra points for stylish tricks, and Strait pulled out his best freestyle prowess as he tried to battle back from a 1.08 differential in the final run of the competition. Throwing down a low backflip barspin, then a double tailwhip, he pulled into the finish coral to find the cheers from the crowd were not enough. He finished .82 behind Slavik, after the cumulative total for the two runs was calculated, for second place. The third place matchup, meanwhile, proved a hotbed of controversy after Adrien Loron was disqualified in semi-final for a false start, forcing him to miss out on the finals. He argued he should be able to punch the gate before regrouping for a third place finish against Greg Watts. “I did it and I was DQ’d and it happens. Few runs before, someone did it and no one said anything – no one complained about it. So I said okay, if someone else can do it, I can too,” explained Loron. Bernard Kerr, Speed & Style World Championship in 2015, did not compete, having withdrawn due to shoulder injury. Kintner, who has admitted to chasing hard for the Queen of Crankworx 2016, was thrilled to take the first female win in the sport and her first win in the 2016 Crankworx World Tour season. “It’s cool to pioneer a new discipline. It’s not an easy event. These kickers are big and a lot different to what we’re used to. I’m glad it was just for speed, and not style, cause I’m sure Brown would have had something to say about that,” she said as the event ended.